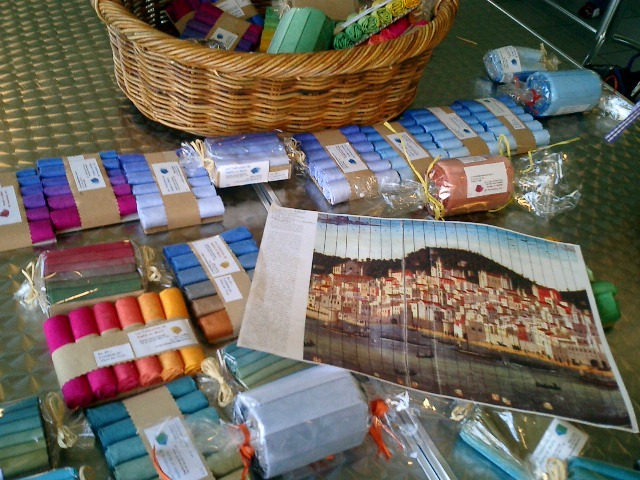 Materiali: hand dyed and commercial cottons and silks. Techniques: freezer paper technique, machine sewing and hand applique. 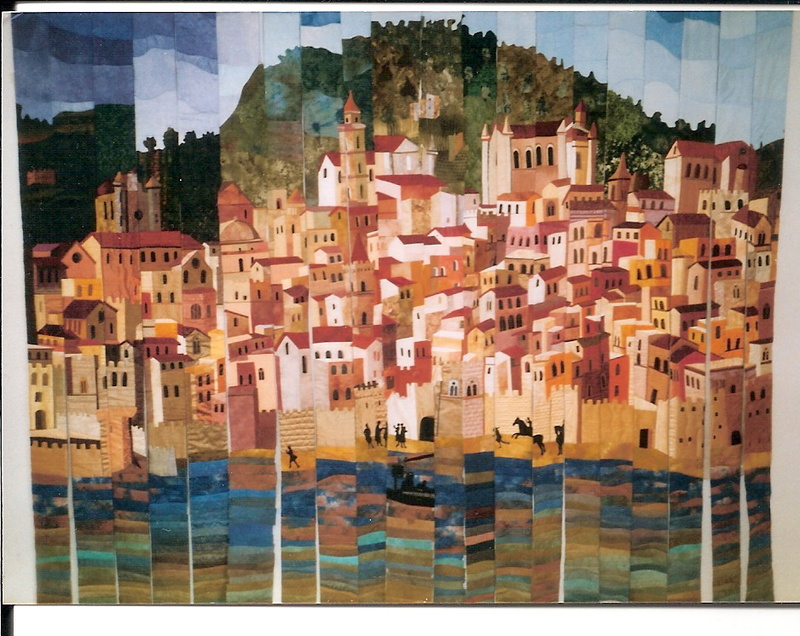 In September 2003 I was invited to the 9th European Patchwork Meeting in Val d’Argent (France) which is an annual meeting that is very well attended not only by European quilters (because of its central location) but also by an international crowd for its great variety of styles and trends from all over the world. It was there that I met Cinzia Buchard and Nathalie Constantin from Leytron, Switzerland, quilters and owner of the quilt shop “Patchmania” in Vetroz, respectively. They liked my pictorial quilts in the exhibition andinvited me to teach a workshop to their local quilt group in Vetroz. In the journey north I traveled with a car full of fabrics, a sample of my quilts for the Swiss group to see, and a gigantic paper pattern for the project that I had in mind for the workshop. 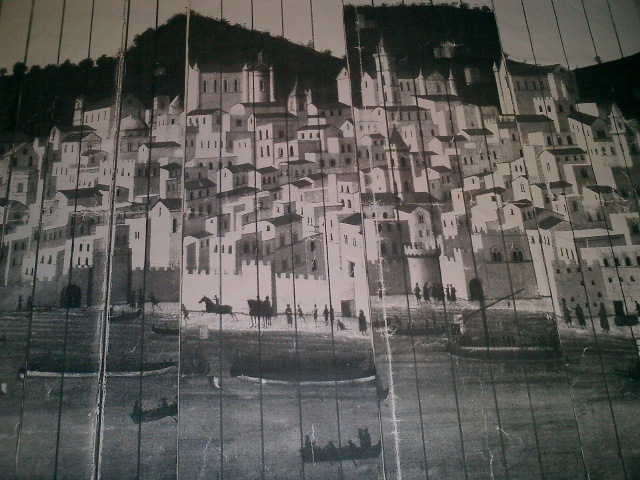 I had been intrigued by a painting from 1480, attributed to Francesco Rosselli, in the San Martino Museum in Naples. I love to depict houses in my quilts but in this painting there were hundreds of them, really far too many for one single quilter! It was the perfect project to share with a group of quilters, and at the same time to show them my pictorial quiltmaking approaches. 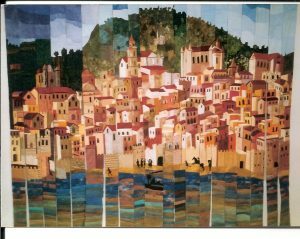 Leaving the art critics to their own disputes, we too, quilters, had our own little misunderstandings to solve at first. Although I could rely on the excellent translations and help of Cinzia Buchard, as I do not speak French, in the first few hours of the workshop I could sense a kind of puzzlement and resentment. 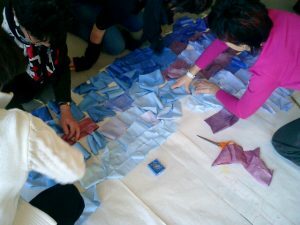 The group had expected to work on a pictorial quilt of their own, what were they supposed to do with one quilt strip each 3 meters long and only 14 cm wide? I explained to them that later they could add by themselves as many strips as they wanted or they could shorten the length of the strips to better fit the space in their walls, or they could frame it to their liking. To start with, we had to choose the fabrics for the sky and I found that from Nathalie’s quilt shop we had plenty of hand-dyed silks to choose from!! The work was a bit uncomfortable, since, due to the proportions of the project, we had to work on the floor but everyone seemed to enjoy the creative part of choosing the fabrics for the houses (see Fig.0064) and for my part I was very happy to see that there were plenty of cottons and silks to choose from for the houses too, with lots of fabrics exchanges within the group as well. The second part of the workshop was spent in the technical aspects of the construction,which involved sewing machines, hand applique, and a few tricks here and there. Once again the help of Cinzia and Nathalie was essential as some people needed a bit more of attention than others. At the end of the two days of the workshop I think that each of us was exhausted and the project was far from being finished but, most importantly, it had gotten started and I perceived that now there was that sense of excitement which I had first felt when I had conceived the project. Cinzia, Nathalie and Janine Vaney continued to coordinate the project as I left for Stockholm. About five months later, at the end of June, I was looking forward to seeing the progress on the Naples quilt and I was really thrilled to see that it had been stunning. 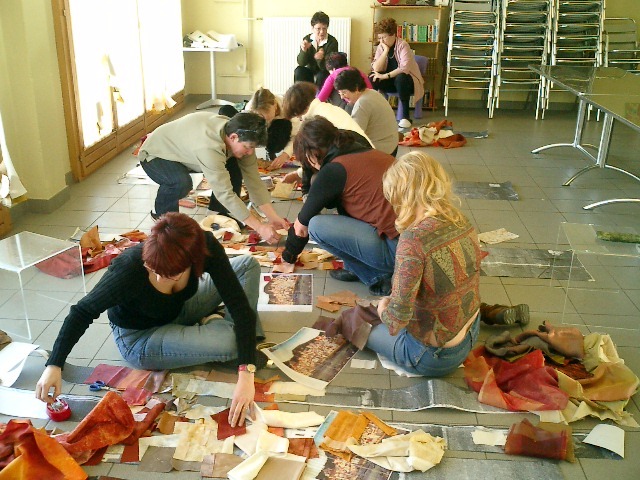 I loved to meet Cinzia, Nathalie, Janine and the other quilters again. It was also a useful stop as there were some finishing problems to be solved such as making these 3 meters long strips fall properly with no twisting, or providingthe replacement for quilters who had no time to finish their strips (I myself took over two strips). Cinzia had each strip match with the other by adjusting properly the length of each one and it was not an easy task (notice that even a horse is divided in half!). That Christmas, Cinzia sent me a greeting card with the most lovely surprise that I could possibly have received: within the oval framed card there was a picture of our finished quilt! 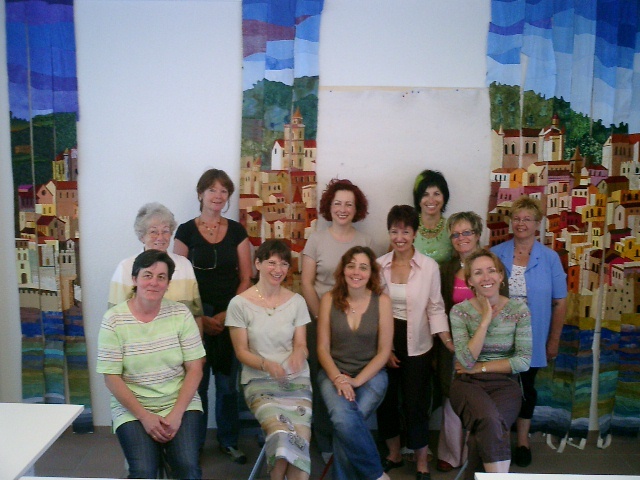 The Vetroz local newspaper on August 31, 2006, published an article entitled: “Thirteen women are at work to create a gigantic quilt”. I think that our efforts have been well rewarded by the results, and none of us will ever take back her own strips as we feel they are by now all united by a common love for quilting.